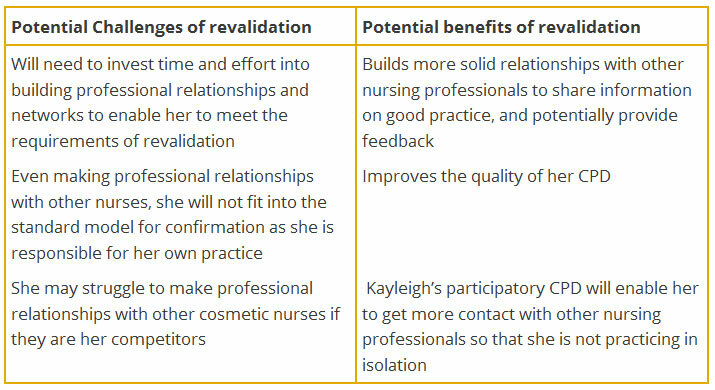 This revalidation case study looks at Kayleigh, a cosmetic/aesthetic nurse, who runs her own business. Profile: Kayleigh is a cosmetic/aesthetic nurse and runs her own business. As she works alone and is her own boss, she isn’t sure how a number of aspects of revalidation will apply to her. Who can I talk to in order to find out what aspects of my role qualify as continuing professional development (CPD) and practice hours? Kayleigh practises full-time and therefore will not have any problems meeting her practice hours requirements. Kayleigh will need to ensure 20 hours of her learning is participatory. One way she can do this is to build professional relationships and join networks with others, which will also assist with meeting the requirements for feedback and confirmation. Who can I obtain confirmation from? Kayleigh does not fit into the standard model for confirmation as she has no-one who is responsible for her practice. She also works alone so has no direct peers. Kayleigh will be required to build professional networks with other Nursing and Midwifery Council-registered nurses and healthcare professionals to get this confirmation. She may be able to do this in conjunction with participatory learning. Kayleigh will still need to collect and reflect on the feedback she receives. She can get this feedback from her patients, and also the other nurses she starts to network with for confirmation and CPD.